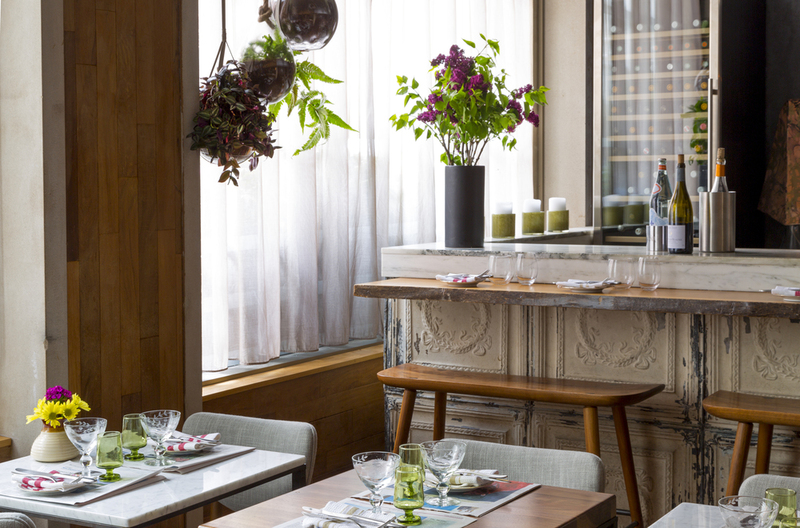 LOCATED IN TRIBECA, WITH AN INTIMATE SPACE SEATING 20, GRAFFITI EARTH FEATURES CHEF JEHANGIR MEHTA’S SIGNATURE ECLECTIC STYLE OF DISHES WITH A STRONG EMPHASIS ON SUSTAINABILITY IN A MORE ELEGANT DOWNTOWN VIBE. At Graffiti Earth, Jehangir will serve vegetable-forward courses with flavors rooted from his native India and Persian heritage, creating an interesting juxtapose of temperatures, textures and tastes, with flavors from all around the globe. Mehta will conscientiously focus on working with unloved produce and underutilized seafood, sustainable proteins and healthy grains with the ultimate goal of reducing food waste. Seafood and meat offerings will be beautifully balanced with plant-based options sharing equal billing if not center stage, in ways that maximize flavor, utilizing “ugly” fruits and vegetables that would otherwise go to waste because of minor (and non-flavor-affecting) aesthetic flaws, and calling for underutilized fish that can be caught without damaging ecosystems. Even outside the kitchen, Graffiti Earth is focused on sustainability from furniture, made from renewable materials, down to the napkins. The dining room of Graffiti Earth has the same intimate feeling as the original with a bit more elegance. A large feature wall displays dishes as a nod to the restaurant’s rural, farmhouse kitchen atmosphere, while warm metals and weathered woods are paired with soft metallic elements for an urban space befitting the restaurant’s Tribeca location. A communal table that seats ten anchors the space while a counter for four and three tables for couples round out the seating. A private dining room is located just outside the main dining room seating nine, available by advance reservations only. The newly minted bar featuring cocktails exclusively crafted by master mixologist Milos Zica of downtown’s popular Employees Only is also located in the lobby of Duane Street Hotel. With a moody ambiance, the bar specializes in an aperitif menu for pre-dinner cocktails and night caps made with specialty vermouths, liqueurs and house infusions.